This is a tour with a "bit of everything"
If you want to our Hamburg, Jutta the best guide in the city. She has a wealth of knowledge and passion about the city. She knows all the little "nooks & crannies" usually overlooked by tourists. Her four-hour tour was comprehensive and absolutely delightful. Just as important, it was exactly what we had asked for, and adapted to our individual interests. Jutta worth every penny-don't use anyone else!! TOUR GUIDE RESPONSE: Thank you so much for your review. I was very happy to show you around. We had a fantastic day out with Jutta. She appeared on time at the hotel (which we changed just a day before the tour). Jutta is very knowledgeable and pretty humorous, we really had a good time. She was flexible, accurate in her explanations and precise in her guidance. 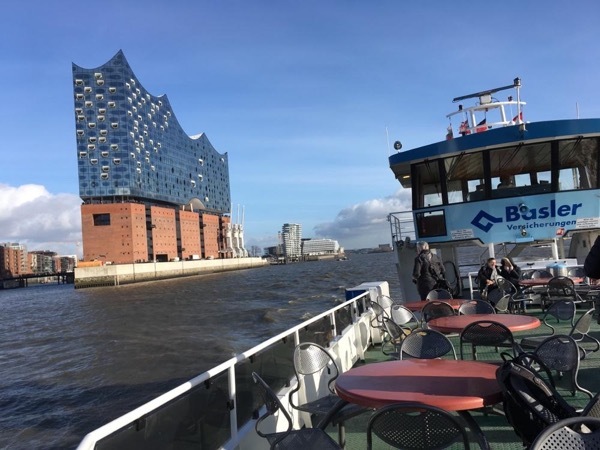 Very simple: a wonderful day out in Hamburg, recommendable to everyone. Jutta could not have provided a more enjoyable and informative experience. Jutta is highly recommended! She conducted a day tour for my husband and me, and our two 20-something sons. She was personally engaged and never lacked for interesting comments. She was mindful of the weather (brisk!) and kept the tour stops close together. She opened our eyes to Hamburg in a personable way and we thank her for that! In a very precise manner Jutta began our tour introducing us to relevant historical data for Hamburg. As we walked we were pleased to realized how experienced and knowledgeable she is. She filled us in with a lot of information which was essential to our understanding of the city and its impact in Germany as a whole. The tour was very well planned and we were left with a profound feeling of satisfaction. As experienced travelers, we recommend Jutta without hesitations. Great tour. Jutta was prompt, knowledgeable and fun. We had a great four hours together. I would do it all again. Jutta was the perfect guide. She was right on time, was very enthusiastic, shared interesting tales of her city, had us in the cathedral just in time for the organ music(! ), and took us to some sites not mentioned in the books. We really enjoyed our tour! Jutta was not available but did send an excellent replacement, Gunnell, and she was wonderful, Organized, knowledgeable. We had a good tour, especially the tour of the new opera house, Thank you , Gunnell. When she heard that we were unable to obtain a guide for Gothenberg, she went out of her way to find someone for us as well. Many thanks, Gunnell. Unfortunately for us it was a Sunday and nothing was open. Our guide delivered everything promised. Wonderful tour by a very knowledgeable guide. Great personality and very attuned to provide a great experience. Our time with Jutta was a complete joy! I can not overstate her courtesy and deep understanding of Hamburg. Book her services without delay!